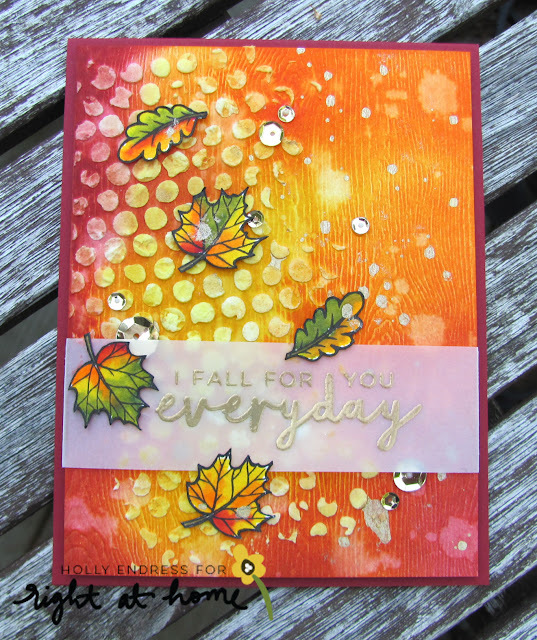 Hollybeary Creations : Happy Fall Y'all!!! Happy Tuesday everyone.. I hope you had a great Holiday Weekend! 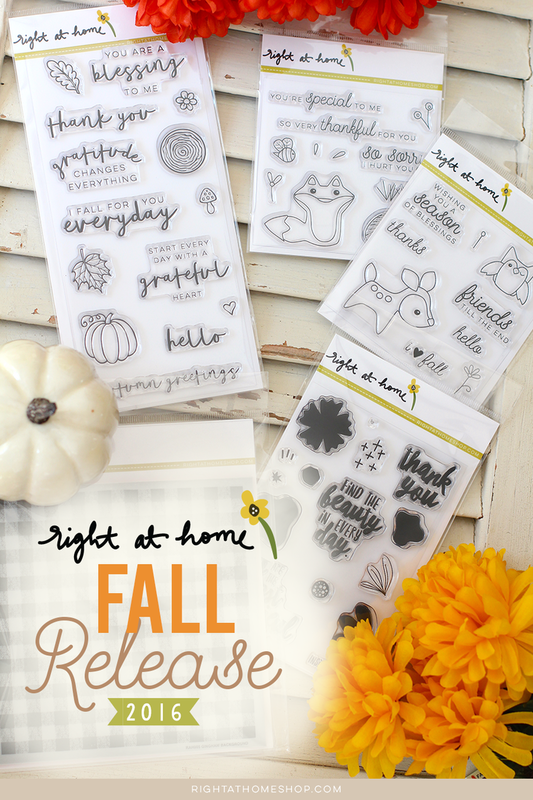 Right at Home just release 10 new sets for Fall & Winter and you are going to want them all!!! Today I'm using the Grateful Heart set . This set is Gorgeous and I love the sentiments, you can use this all year round. 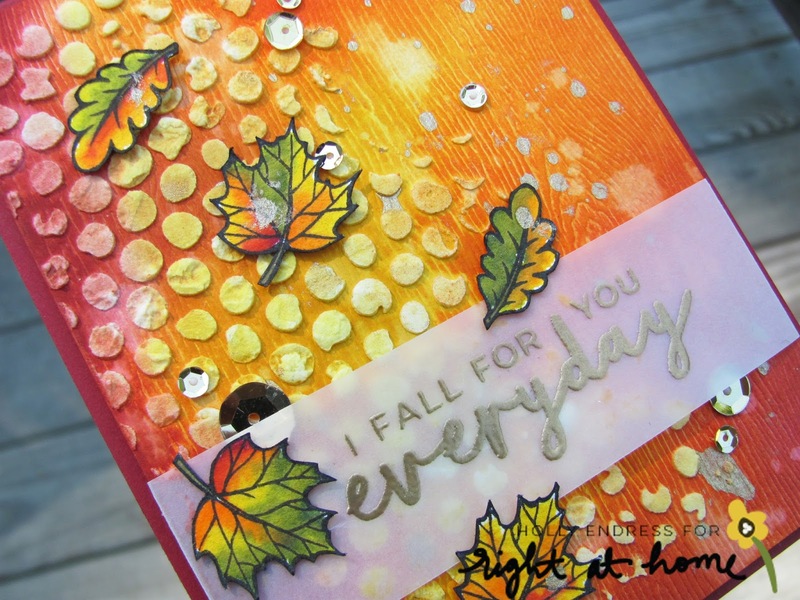 I started with a piece of Tim Holtz Watercolor Woodgrain paper and I added some Distress inks in Marmalade, Mustard Seed and Brick with a mini ink blending tool. Then I added some Water drops and dabbed them off with a paper towel. Once it was dry I added some texture with some White Embossing Paste and the Bubbles Stencil from Tim Holtz. I heat set the paste but I would recommend letting it dry on it's own. Once the past was dry I added some additional Mustard Seed ink over the bubbles and then I added some more drops of water and dabbed them off. I set the panel aside to dry and then I added some splatter of Bronze Distress Stain. Once the panel was completely dry I trimmed an 1/4" off each side. 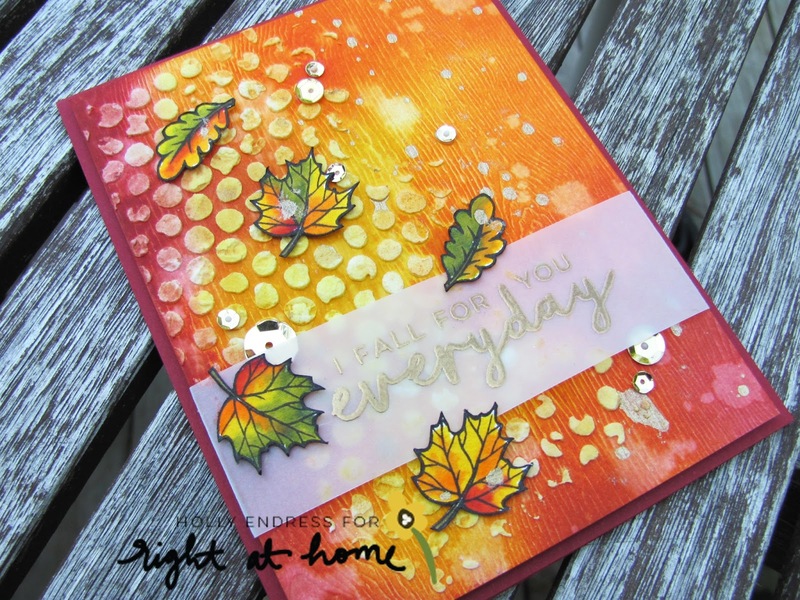 I stamped the sentiment from the same set onto a piece of vellum and heat embossed it in Gold. Then I added the strip of vellum around the card and adhered the panel to a Cherry Cobbler top folding card base. I stamped the leaves onto some Watercolor paper using VersaFine Black ink and I colored them in with Zig Clean Color Real Brush Markers. I added some of the Olive, Red and Orange and then I blended them with the Yellow marker. I cut them out and added some Black marker to the edges. I adhered them on the card with some Tombow Multi Liquid glue. For an added pop of Shimmer I added some Gold sequins from the Ton. 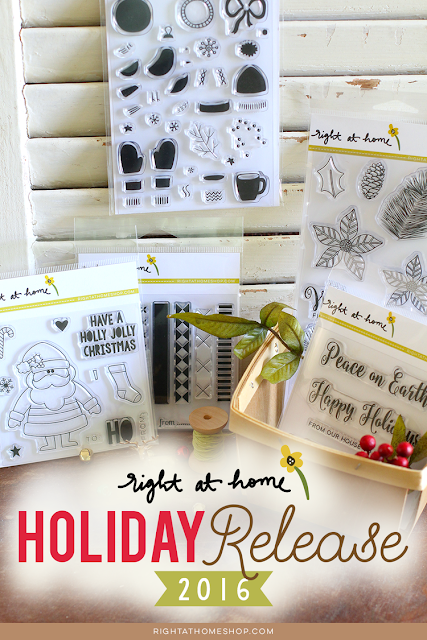 Head over to the Right at Home Blog for more inspiration and be sure to stop by the store and pick up your New Release! Not sure how I missed this but OY, this is a beauty!